Whereas the Zygomycetes are mostly terrestrial, the Oomycetes are mostly aquatic and are thus often called "water molds." The term is somewhat misleading, however, because not only do numerous other fungi also grow in water, but Oomycetes can frequently be found growing in soil. Sexual reproduction is heterogamous. The walls are mainly of cellulose. Flagellated mitospores and meiospores are produced. Figure 18-5 A riematode-trapping, carnivorous fungus. 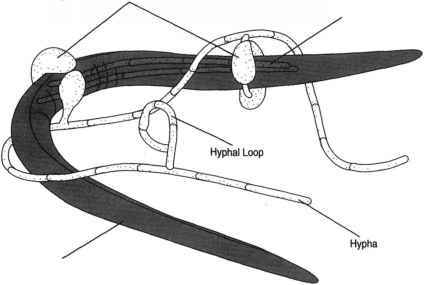 Hyphae of Fungus also biflagellated, but with the flagella laterally placed, and are described as kidney shaped (reniform). They can each grow a new mycelium after making contact with a suitable substrate, such as the body of a fish. Figure 18-6 Saprolegnia. The top row shows asexual reproduction, (a) A mitosporangium, which breaks up into a number of biflagellated zoospores, (b), each having a tinsel-type flagellum and a whiplash flagellum, (c). (d) The flagella disappear and new flagella are produced. (e)These flagella are lost when the spore grows new hyphae. The bottom row shows sexual reproduction, (f) An oogonium, consisting of a single cell containing several eggs. An antheridial hypha grows upwardly nearby, producing an antheridium that comes in contact with the oogonium, (g) The wall is broken down, and fertilization produces oospores. # Notes # nearby hyphae. The antheridia grow to make contact with and penetrate the oogonial wall. Male nuclei are discharged into the oogonium and fuse with the eggs to produce zygotes. The zygotes develop resistant walls and remain dormant for some time. When they germinate, they produce biflagellated zoospores, which can then produce new mycelia. This form of sexual reproduction bears certain resemblances to that of Vaucheria, leading some investigators to suggest that they are related forms. Albugo Candida is another Oomycete. This fungus attacks members of the mustard family of plants and is known as a "white rust." Both asexual and sexual reproduction occur. In asexual reproduction, chains of multinucleated sporangia are cut off from the end of a hypha and are dispersed in the air. When the sporangia break open, each nucleus emerges as a biciliated spore. Note that rather than dispersing spores directly, Albugo Candida disperses sporangia. The spores are ciliated when they emerge from the sporangium, but soon lose their cilia, come to rest, and develop into new mycelia. In the sexual phase of reproduction, oogonia and antheridia are produced, developing on separate hyphae in the intercellular spaces of the host tissue. The infestation occurs immediately under the epidermis of the stem of the host tissue. The invasion is probably accomplished through a stomate. In the oogonium, a central nucleus develops into an egg, and one nucleus from the antheridium unites with the egg cell. Both the oogonia and antheridia are coenocytic. A zygote is formed, and a resting stage of the zygote, called a chlamydospore, follows. When the chlamydospore germinates, it gives rise to numerous zoospores, each of which can develop a new mycelium. Phytophthora infestans is an Oomycete that played an integral role in the tragic history of the Irish people. This fungus causes late blight in potatoes and tomatoes, and from 1845 to 1847 devastated the potato crops of Europe and Ireland. The consequence was massive starvation and emigration. Potatoes were the sole culture. While the Irish grew several other crops, these crops were exported. Home consumption was limited primarily to potatoes, sometimes augmented by eggs and milk. Potatoes were easy to grow and nutritious. Although there was usually a family pig, it could not be eaten because it often had to be sold to pay the rent. Thus, the average consumption of potatoes in good times was eight pounds per person per day, and children went to school with potatoes in their pockets. Figure 18-7 Albugo Candida. 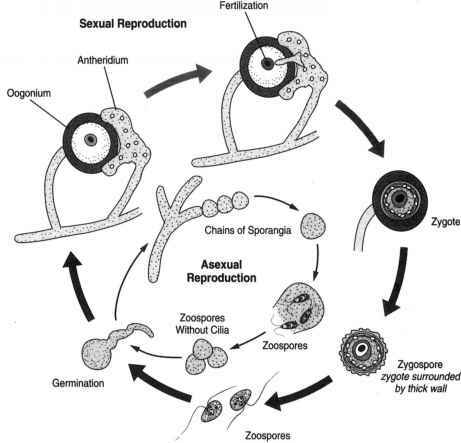 In asexual reproduction, chains of sporangia break away from the hyphae. When mature, the sporangium ruptures, releasing zoospores, which swim about for a time, lose their cilia and grow into a new mycelium. In sexual reproduction, fertilization occurs when the male gamete of the antheridium penetrates the oogonium to fertilize the egg cell. The zygospore thus formed produces biciliated zoospores which grow a new mycelium.